26-year old Sharks eighthman, Ryan Kankowski, has signed a 6-month contract with Top League Rugby Union team, Toyota Verblitz club in Aichi, Japan. The Sharks have agreed to release him for this time on a sabbatical from his Durban based side in order to gain experience in the east. 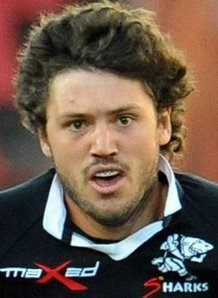 He will join his new team-mates from 6 August until 16 February next year, allowing him to be back in Durban, to rejoin The Sharks for their Super Rugby 2013 campaign. A product of the world recognised Sharks Academy, he joined The Sharks in 2006, making his debut in the black and white jersey during the Currie Cup season against the Lions. With his tall athletic frame he soon made a name for himself as a pacey and skilled eighthman, but also capable of playing as an openside flanker. He has a natural flair on attack, with the ability of breaking the line with powerful runs from the back of the scrum, and is unrelenting on defence. Kankowski was first selected to represent South Africa during the Springboks 2007 end of year tour to Wales and England. He made a try-scoring Test debut as a substitute during the Springboks resounding 34-11 victory over Wales at Millennium Stadium. His stand-out year came in 2008 when he received multiple nominations for his performances at Super Rugby and provincial level and was subsequently rewarded by being part of the Springboks Incoming Tour, their Tri-Nations squad and their end of year outgoing tour. Since then he has been a regular in the Springbok team with 19 caps to his name. At provincial level, he has an impressive try-scoring record of 30 tries and amassed 129 caps for The Sharks. Before leaving for Japan, Kankowski will feature in the Springboks final Test against England at the Nelson Mandela Bay Stadium on Saturday, coming off the bench and providing cover as a loose forward.